This imposing sword will sting you! New from Black Legion, the Feel the Sting Sword has a ferocious sting to it that will get you! The razor-sharp “stingers” at the top of the spine and on the underside of the blade, right before the edge, are impressive. 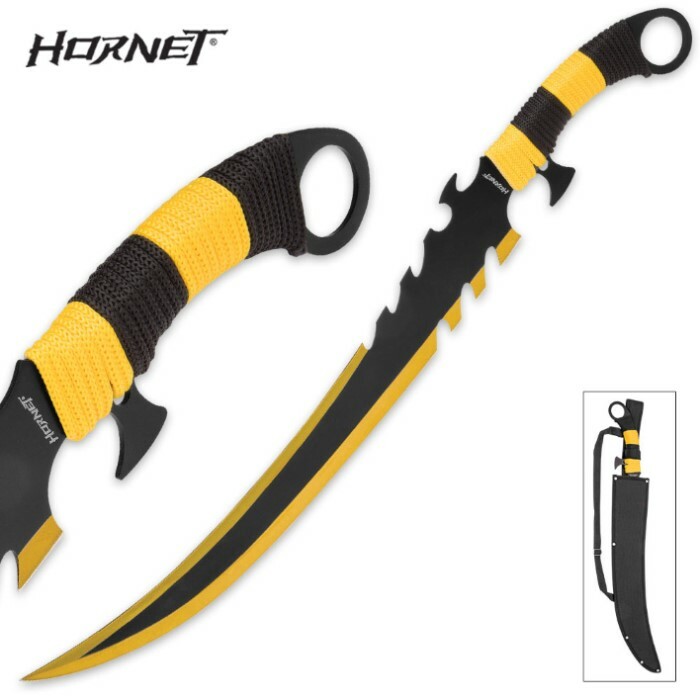 An imposing 18" in length, the fantasy sword is crafted of one, solid piece of black and yellow stainless steel. 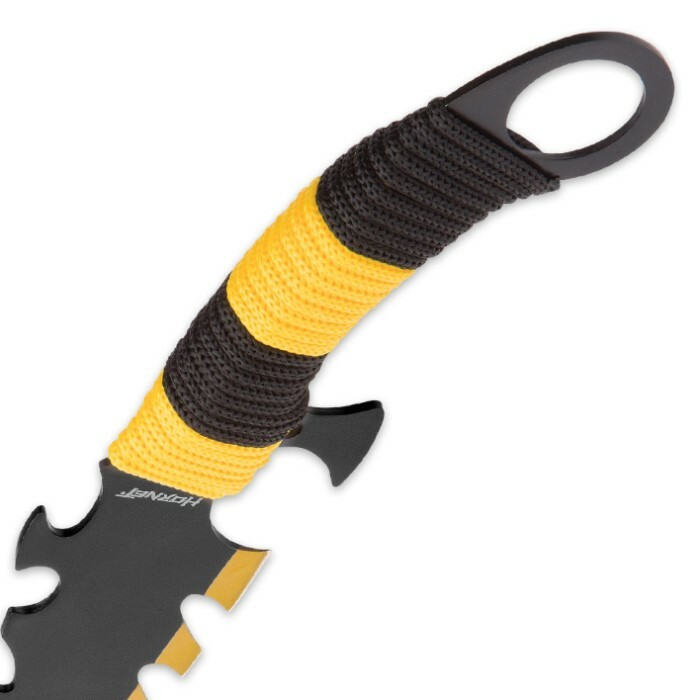 Complimenting the blade is yellow and black cord-wrap on the handle. 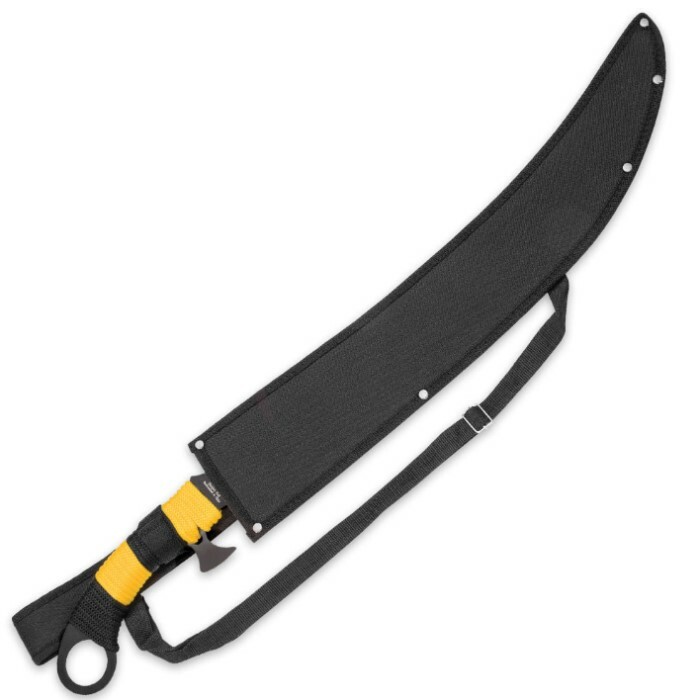 A sturdy nylon sheath with a shoulder strap and belt loop is included. The sword is 25 1/2” in overall length. SHARP FOR A GREAT PRICE! This fantasy sword feels very different then others! It feels katana like. The blade is surprisingly razor sharp. It cuts things like butter, which I did not expect considering this is a fantasy sword. This sword is everything you could want, Sharpness, Looks, & Good Handling. I am VERY impressed by this sword! It is extremely sharp, has exceptional balance, and the curved hilt section provides excellent ergonomic benefits. The only aspect of this weapon I don't like, and this is negligible, is that the hilt section only accommodates a single handed grip; I'd love to see one of these things with a hilt section which can accommodate a two handed grip while maintaining the curve as well as at least a 24" blade. However, for what it is, I love this sword, and I give it a 5/5! Beautiful blade, very sharp. I am very satisfied with my decision. Thanks True Swords!